The KitchenAid trade name has always stood for versatility, reliability and durability. 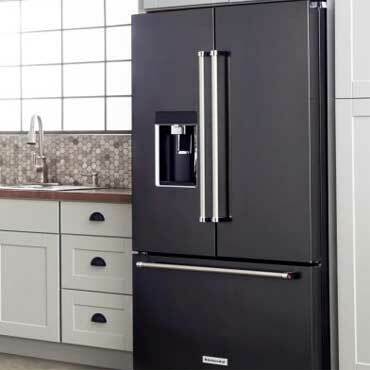 From the classic stand mixer, to powerful convection ovens. . .from sleek built-in refrigerators, to almost silent stainless-steel interior dishwashers, KitchenAid® products are the choice for producing great results. KitchenAid people are continually working to improve our products and provide superior service and customer support. Millions of consumers look to KitchenAid for expert help and high-performance products that lead to great results every time. KitchenAid® products are considered key ingredients to successful cooking and food shows all around the country, featuring top chefs and cookbook authors. Click here to see what's coming up. The emphasis is on fun at the KitchenAid Experience. Learn professional cooking techniques, "test-drive" innovative new products, savor exotic gourmet foods and flavors - all at the KitchenAid Experience in Greenville, Ohio. KitchenAid brand quality performance virtually speaks for itself, but we love to hear from satisfied KitchenAid customers about their experiences.